Pneumatic tyre is a flexible, toroidal, compressed gas (normally air) container mechanically attached to the outer circumference of rim of a vehicle wheel. The name is derived from “Attire” – a protecting covering or coat. 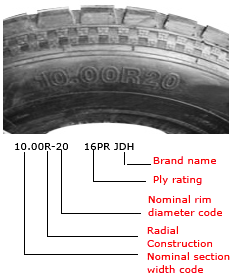 The rubber exterior of a pneumatic tyre is merely a flesh for a skeleton of fabric; this skeleton and the manner in which it is constructed are of fundamental importance in establishing the tyre’s characteristics. 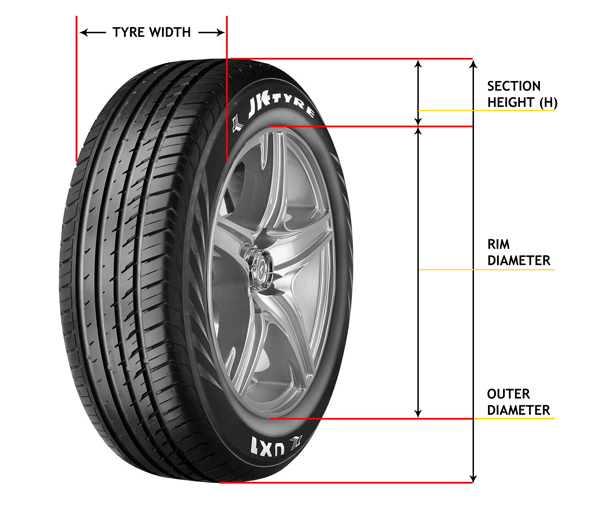 A tyre is an integral component of a vehicle and is the intermediary between the vehicle and the road. Why do I need Tyre? Tread: The portion of the tyre, which comes in contact with the road, is called the tread. It is designed to provide the necessary traction, wear resistance, and allow for low heat build up and low noise. 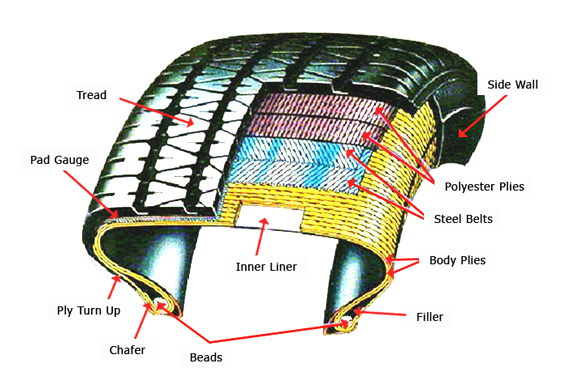 Side Walls: These are the layers of appropriate thickness of rubber compound applied on both sides of the tyre carcass between the beads and tread. Plies: Plies atr reinforcing members of the tyre, which are made from rubber coated fabric (Rayon, Nylon, Steel, Polyester etc. 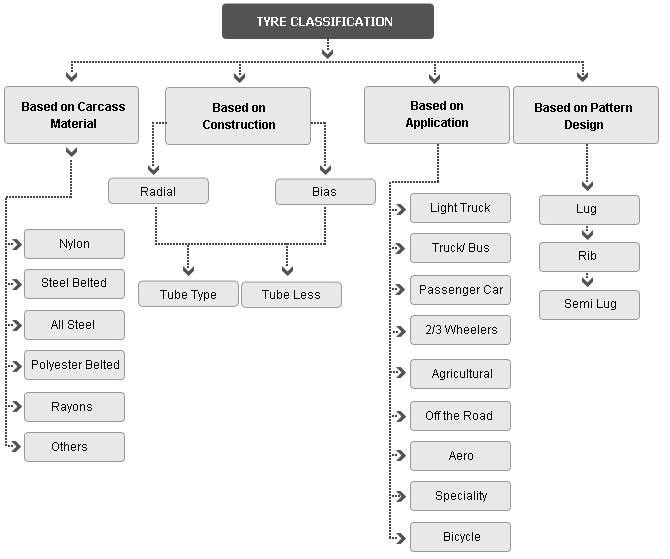 For bias tyres Nylon is the most commonly used fabric whereas Polyester is used for Passenger radial and steel for truck radials. 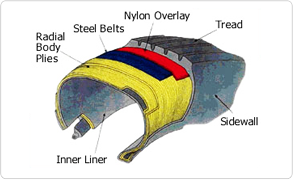 Bead: Layers of rubber coated high tensile steel wires formed into inextensible loops. 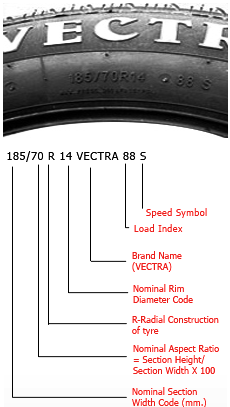 The table explains the relationship between the speed symbol shown on the tyre and the maximum speed, which is possible with the particular tyre. 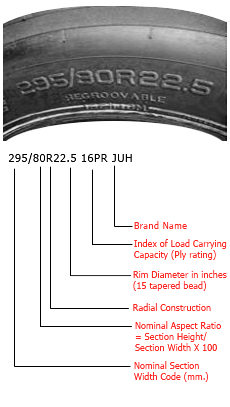 The table explains the relation between the load Index shown on the tyre and actual load taking capacity. Carcass ply cords run at 90 degrees to circumferential axis. Carcass stabilized by steel belts. In Diagonal ( Bias ) ply tyre carcass ply chords extend to the beads diagonally run at an angle of 30 – 45 *with respect to circumferential axis. Longer tyre life resulting from lesser tread squirming & shuffling. 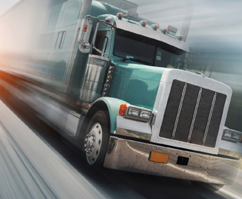 Improved fuel efficiency due to Reduced rolling resistance . Better high speed performance: Better dimensional & directional stability due to reduced edgewise bending. Tubeless tyres, as the name suggests, are tyres without the tube. The tyre is built in such a way that it can contain the air by itself. It does not require a tube within it. 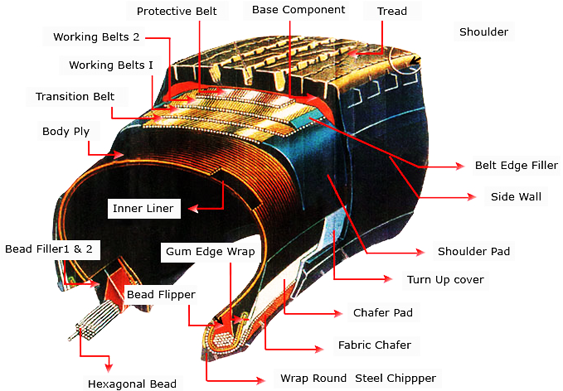 The tyre and rim assembly form an air container, to “Seal” and “Contain” the compressed air inside the assembly. 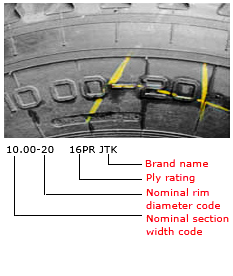 The tyre has a halo- or chloro-butyl lining on its inside which is airtight. 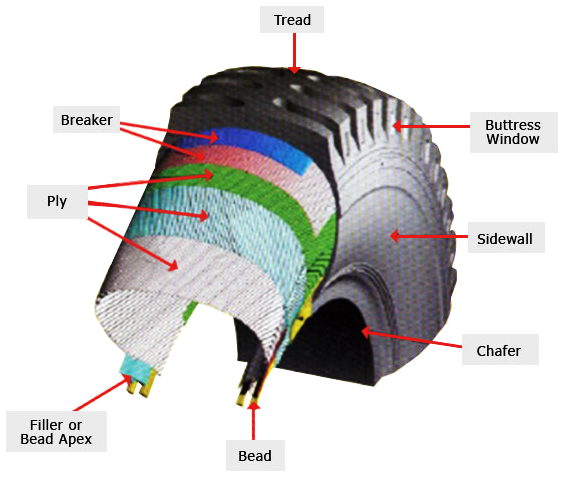 Together with the airtight joint between the tyre and the wheel, the membrane forms a container that holds the air for the tyre. A valve is fitted on to the rim for inflation or deflation to the assembly. Since tube is eliminated , friction between tyre & tube is not experienced, thus lower rolling resistance, improved fuel efficiency, less vibrations, less heat generation and better comfort. Chances of tube getting pinched under the bead while mounting are eliminated. Lower tyre/wheel weight (un-sprung mass) results in better vehicle handling and therefore longer life. 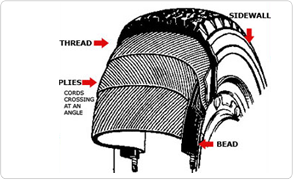 In case a nail or other sharp object penetrate a tubeless tyre, the air loss is not sudden. 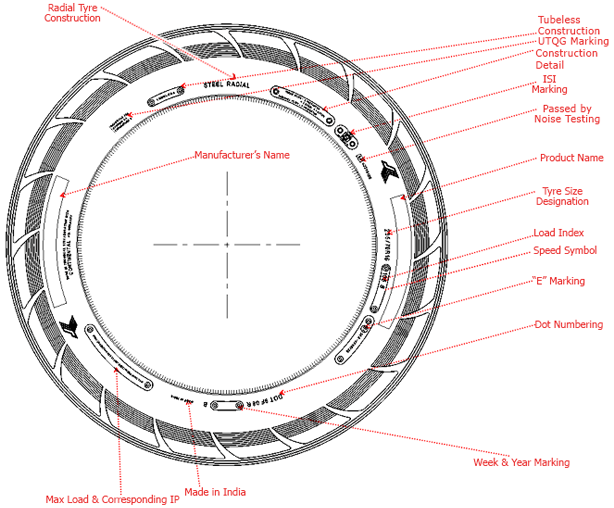 The tyre wheel assembly continues to perform its function for some time before going flat. This ensures and is one of the biggest advantages of a tubeless tyre. If there is a sharp penetration in a tube tyre, the air in the tube starts leaking suddenly and rapidly in all directions. 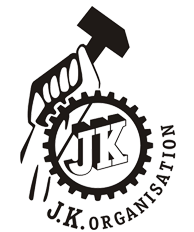 This causes the wheel assembly to loose stability thereby resulting in accidents. Since there is no tube in tubeless tyre the probable and associated potential problems such as “Defective Splice”, “Defective Valve Base”, “Thin Gauge”, “Foreign matter” or “Pin Hole” are eliminated, ensuring safety of the wheel assembly. Tubeless tyre beads are designed to seat on the rim bead seat area with higher “interference” (tight fit) as compared to a tube type tyre. In the event of air loss the chances of bead unseating from the rim is less, therefore providing higher safety.